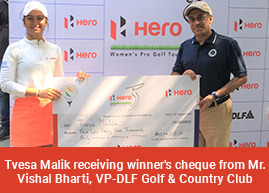 Greater NOIDA, September 7: Afshan Fatima finally broke through for her maiden title as a professional as she came back from four shots to edge out Amandeep Drall on the second play-off hole in the 13th leg of the Hero Women’s Pro Golf Tour at the Jaypee Greens in Greater Noida. Afshan was 6-over 150 after 36 holes, while Amandeep, the only player to have won three times this season, 2-over through two rounds. Afshan carded 1-under 71 as Amandeep went to 3-over 75, which meant both players were tied 5-over 221. In the play-off, both players were once again tied and then Afshan pipped Amandeep in the second play-off hole. This was the second tournament at the Jaypee Greens this year and last time in February in the fifth leg, Gursimar Badwal was the winner, while Afshan had one of her best finishes at Tied-fourth when she shot 3-under 69 in the second round. Afshan clearly likes the course. The 22-year-old Afshan has time and again impressed, but this time she went all the way and finished right on top and this should give her a lot of confidence. She received her winning cheque from Mr. Sanjeev Rampal, Senior Vice President, Jaypee Greens. Tvesa Malik had a fine run between 10th to 13th with three birdies and carded 1-under 71 to finish sole third. It also helped her keep the lead on the Hero Order of Merit, while Amandeep stayed second. Neha Tripathi, who had a tough time scoring 80-84 on the first two days, finally found some rhythm to shoot even par 72. She was Tied-10th, but maintained third place on the money list. Afshan and Amandeep playing together in the final group had birdies on the second. However, Afshan had a double bogey on Par-5 third, which pushed her six shots behind Amandeep. Things started going Afshan’s way after that as she birdied fifth and sixth, while Amandeep bogeyed fourth and fifth. At that stage Amandeep still held a two-shot lead. Afshan played very steadily and parred every hole from seventh to 18th, while Amandeep dropped a shot on 11thand the gap was down to one shot. As Amandeep bogeyed 14th and Afshan parred, the two were tied. Both tried hard but failed to find any birdies on the last four holes. That sent the battle into a tie-breaker for the third time this year. Afshan, who has been supported by the Women’s Golf Association of India while coming up, held her nerve and won on the second play-off hole. Siddhi Kapoor (76) and Gurimsar Badwal (79) were fourth and fifth, while Gaurika Bishnoi and Ayesha Kapur shot 77 each to be Tied-6th. First round leader, amateur Tanirika Singh had a rough day at 83 and ended eighth, while Suchitra Ramesh (78) was ninth. Neha (72) and Khushi Khanijau (76) were Tied-10th. On the Hero Order of Merit, Tvesa is followed by Amandeep and Neha. Gursimar is fourth, while Suchitra Ramesh is fifth. After today's win, Afshan Fatima has moved up to sixth.